Naughty Nuri's is an Indonesian grill house famed for its ribs and martini in Ubud, Bali. It has since expanded to more than 10 locations including Australia, Malaysia and Singapore – Capitol Piazza and Tanjong Katong. Its décor at the former looks nothing "Warung" as it took over the 1st floor space vacated by Japanese restaurant Zaku beside Dazzling Café. I have been wanting to visit the restaurant for a while and finally dropped by recently, for lunch on a weekday. My dining companions and I ordered a Christmas Set consisting of its Signature St. Louis Full Rack, Crispy Pig Ears and two bottles of Bintang beers as well as an Orang Dua Platter for sharing. The half rack of pork ribs from the latter looked bigger and had more fats. Both were nonetheless fork-tender and supposedly marinated in its home blend signature sauce though I preferred the sauce for its Ayam Panggang. Could neither rave about the Squid Bakar nor fault the homemade achar. 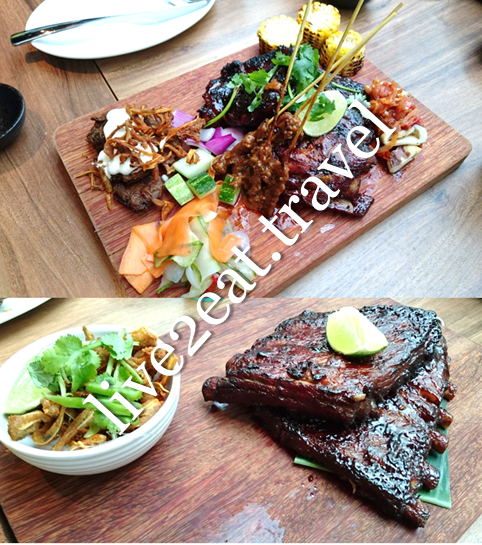 Crispy Pig Ears, Satay Lokal and Smashed Potatoes with Pork Scratchings were good. For most of us, it was our first time trying pig ears. True to its name, they were deep-fried 'til crispy. Sprinkled with curry powder, these were so addictive we could not stop. And in case you are wondering, pork scratchings (also known as pork cracklings) are made from pork rind or skin. Update: The restaurant has closed. Eat to live or live to eat? I definitely live to eat. And travel, of course! © 2012-2018 live2eat.travel. Powered by Blogger.